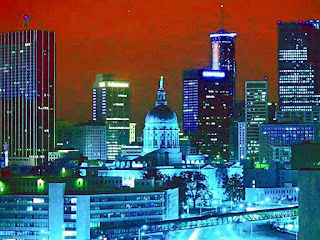 Atlanta has one of the most progressive and largest gay & lesbian communities in the entire South, excluding Florida. Anchored by Piedmont Park, north of the city, we start with the Midtown area of Atlanta. In Midtown, the gay community is spread out all throughout this region, with clusters of bars, restaurants and other gay retailers including Blakes on the Park and Outwrite Books; Ansley Mall, north of Midtown on Piedmont and Monroe with Burkhart's Pub, Brushstrokes, a number of other bars and the famous Cowtippers restaurant halfway between Midtown and Ansley Mall; Cheshire Bridge Road with The Heretic and other bars; Woofs even farther north; east side of Piedmont Park with Big Red Tomato and Red Chair; and the Midtown Promenade with Hoedowns and other bars. Atlanta has two strong gay & lesbian business associations, and both their pride and film festivals are some of the largest in the country. In addition, their local Convention & Visitors Bureau (CVB) has begun marketing Atlanta officially to gay & lesbian travelers and has a section of their website dedicated to this sector. Delta Airlines, based in Atlanta, has also begun to make outreach to the gay & lesbian community and has marketed itself in event, print and Internet advertising in 2004.